Chance and Circumstance met on the banks of a fast river in a mad hurry for the sea. And here is the story of that meeting. There is a less travelled river place, not far from Listowel, where the Smearla falls in to the Feale, known as the Joinings. A small girl from a hill outside Mallow met a tall Kenyan runner on the banks of the Feale at the Kerry Crusaders Half Marathon and 10K. There was a beauty there in the Kerry air when the Kenyan sportsman instinctively placed his winner's medal around the neck of the little blonde child who has been through so much. Anna was the official starter. She had great help. Catherina McKiernan was Anna Browne's countdown girl. Catherina has great time for me now. In the pre-race briefing I gave her an Olympic silver she never won, on top of the World and European Cross Country medals and her London Marathon win. She smiled away. Catherina did the build-up for the human Listowel races. Her advice to the runners was never give in to the tiredness. "That's what athletics is all about." Anna, who knows all about not giving up, was so excited at the start when she sounded the hooter. "I want this for waking up my brothers for school," giggled Anna. If you're looking for bad news, move on back the paper a bit. Sometimes the bad news overwhelms us but if you need cheering up on these short evenings of deepening dark November, read away on down the page. I promise we will get in to good form, and work this Monday will come as easy as the last hour on Friday evening. 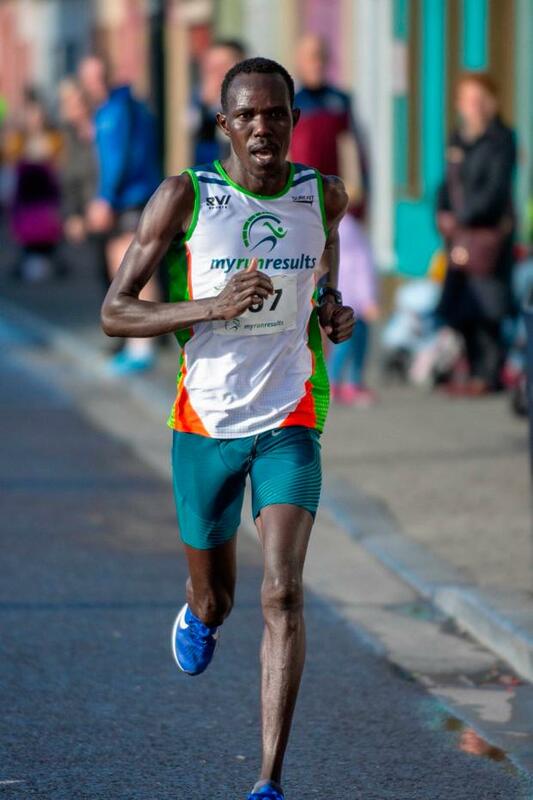 Freddy Keron Stuk, the Dublin-based Kenyan star who runs for Raheny Shamrocks, had just broken the course record for the Listowel half-marathon and he was in the best of form. Donal White broke the record for the 10K. I meet Donal most days in our town park. Donal runs like he is in a hurry but when he stops the man is laid-back and almost Kenyan. There is a Kenyan way and a Kenyan gait. Freddy's magic feet touch the ground one at a time with the merest skim like a ripple in a tide pool. He runs on his toes and with his heart. He runs for fun. Later on that night Mourne Abbey footballer Anna Browne, aged eight, presented a victory mug to Freddy, aged late thirties. By chance there was a trumpet player in our bar. Sergeant Byrne, formerly of the Irish army, played a victory fanfare. Freddy is very sociable and he always has a smile on his face. "Billy, I love to run and God made me good at running. That is all it is." Kids make friends easily and instinctively, with no more of a background check than a child's intuition. The usual question the kids ask is "can I be your friend?" Freddy said "yes." Freddy, so far away from his beloved Kenya, was very much at home among the rivers and bogs of North Kerry. He wasn't Irish enough for some who would nearly want to see Finn McCool on the birth cert. Good people know good people. The Crusaders are mad about him. Freddy's eyes welled up. I'm fairy sure these were happy tears. Freddy was delighted so many appreciated him as a person and as an athlete. Howard died in an accident some years back. We were good friends. This is a feel-good story, but here's the feel-bad part. Anna, a kid with cerebral palsy, would have been kept waiting for an operation for at least five years by the HSE. She was in constant pain and the pain was getting worse. Anna fell a hundred times a day. Her family were worn out from the night-time nursing. Her mother Evelyn and father Roy fought for their little girl. Anna's family raised €100,000. The operation was performed last July in the US. Now she can walk in to school with her friends. Anna is off to Wales for specialist physio tomorrow. Anna owns Jonathan Sexton's boots. Yes, the ones he wore for the Grand Slam, Le Drop and the Champions Cup. An anonymous Dub gave 10 grand up front on condition Anna's family could use the money to fund her operation. Betty Boots, as we call her, will give up on her 10 grand if there's a better bid. I met Betty over the summer. I knew for sure Dublin would win the four in a row when Betty was so good to Anna. Some day we will arrange for Betty and Freddy to meet up. They would get along famously. The boot auction takes place on November 28 at Sheppard's Irish Auction House in Durrow, Co Laois. The auction will also be live online at www.sheppards.ie. Sheppard's have waived their commission. There is more feel-good in today's piece than you would get in an episode of Little House on the Prairie: Anna's big brother Sean won a county with Clydagh Rovers on Saturday, after extra-time. Freddy, Anna, her loving family, the Kerry Crusaders, Catherina and the trumpet player all came together at the Joinings on Saturday. Good people should get together more often.